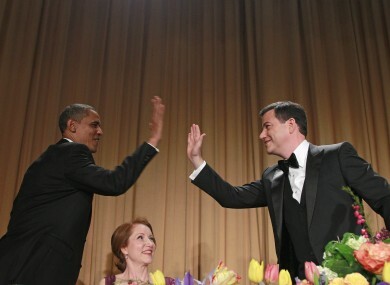 THE SECRET SERVICE, Donald Trump, Kim Kardashian and Republican front runner Mitt Romney were all targets for US President Barack Obama’s humor at last night’s celebrity studded White House Correspondents Dinner. Even the entrance to his speech was part of his schtick. The president walked off stage just before he took the podium with an alleged “hot mic,” making fun of getting caught last month on an open microphone with Russian President Dmitry Medvedev. Once on stage, the president revisited last year’s dinner, which took place as Navy SEALS were dispatched to capture and kill Osama bin Laden. “Last year at this time, this very weekend, we finally delivered justice to one of the world’s most notorious individuals,” Obama said. Then a picture of real estate mogul Donald Trump appeared on the room’s television monitors. The president last year delivered a scathing roast of Trump, who flirted with running for the Republican nomination and claimed he had solved the “mystery” of Obama’s birth certificate. Four years ago, Obama recalled, he was locked in a tough primary fight with Hillary Rodham Clinton, now his secretary of state. he said, referring to their recent trip to the Summit of the Americas in Colombia, where Clinton was photographed drinking a beer and dancing. Obama also had a pop at Mitt Romney, who has been dogged by the story of his long-time ago family road trip when he affixed his family pet aboard the roof of his station wagon in a kennel. But Obama touched on serious themes as well, remembering The New York Times’ Anthony Shadid and Marie Colvin of the Sunday Times of London who died while covering the uprising in Syria. “If this had happened on President Clinton’s watch, you can damn well bet those Secret Service agents would have been disciplined with a very serious high five,” Kimmel said. Among the eclectic crowd attending Saturday night’s dinner were former Secretary of State Colin Powell, the cast of the hit TV show “Modern Family”, Lindsey Lohan, George Clooney and Steven Spielberg. Email “Kardashians, drunk texting and a Romney Roast: Obama's latest White House speech”. Feedback on “Kardashians, drunk texting and a Romney Roast: Obama's latest White House speech”.